Needles Highway is the most impressive road that I have driven on – so far. 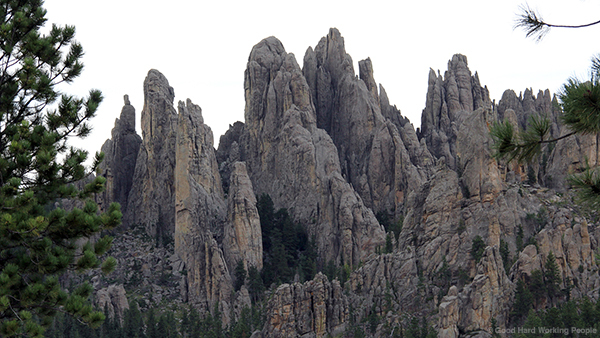 Located in Custer State Park, along South Dakota Highway 87, Needles Highway is part of the Peter Norbeck Scenic Byway. The name of the highway, built in 1922, is inspired by the granite spires that the highway winds around. Highlights include the Cathedral Spires (a Registered Natural Landmark), the Needle Eye Tunnel and the Needle Eye itself. The wildlife we saw along the way, like mountain goats and chipmunks, I put into the accompanying video Custer State Park (South Dakota) – In Another Minute (Week 251), which I published last week. You may notice that this video shows more photographs than actual video footage. That’s because I wasn’t all that satisfied with the material from my old Lumix now that I have the Sony RX-100… The photos were taken with a Canon 60D. This will be the last video from our Black Hills road trip, which Scott, Whiskey and I took in September 2014. We are already planning to go back to Custer State Park and revisit Needles Highway and Sylvan Lake. I can’t wait to hike around those granite Needles! If you’d like, check out the other videos I made in the Black Hills. The song in this video is the instrumental version of “I’ll Be Right Behind You, Josephine” by Josh Woodward. This work is licensed under a Creative Commons Attribution 4.0 License. Thank you for all your great music, Josh!